What's not been done on this home? I dare you to find it! 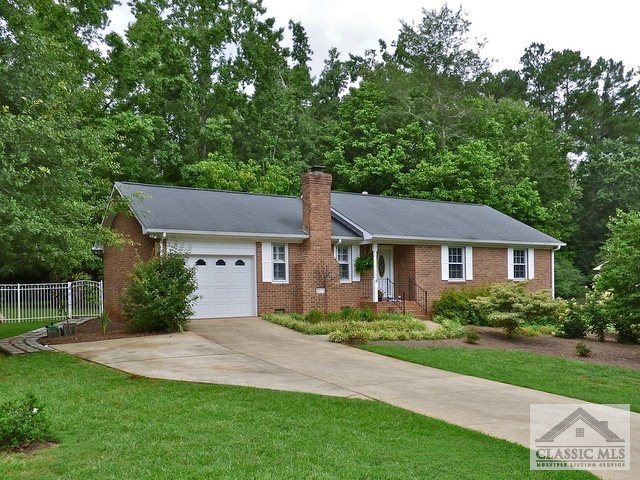 Meticulously maintained, updated, and expanded one-owner home so close and a level walk/ride to the UGA Vet Med Campus. 3 Bed 2 Bath home with updated bathrooms, and kitchen with updated appliance package and many custom touches (seller to leave eat-at peninsula and small china cabinet). Open Floor Plan with Vault Ceiling and gorgeous brick fireplace with top-line gas logs. All new energy saving doors, including Pella slider to newly constructed screened porch room that was attached to the home's main frame and designed to be expandable to heated square footage, with HVAC vent access right behind ceiling and porch superstructure designed for insulation in floors and window installation (over $10,000.00 addition). All porch knee walls have been framed for glass installation. Tinkerer do-it-yourselfer garage is awesome and clean with above garage storage. Lockable Workshop with storage, work bench and tool storage space, and light. New insulated garage door and opener. Door from garage into kitchen has insulated storm door. Beautifully and thoughtfully landscaped property has two fully fenced/separated areas, one for a family dog that stays once in a while (its a monster romping space!) and a huge back yard for the family with street-facing fence being ornamental metal fencing with ample gates for movement of larger equipment and supplies. Lockable Yard Shed stays! Home has a just-renewed HVAC service contract with Shumate so the next service is already paid for and American Pest Control termite bond just renewed as well. Best Find on the rapidly rising East Side! Brookstone is a subdivision within the city of Athens, Georgia. There are currently 0 Homes for Sale within Brookstone, with asking prices ranging from $0 to $0. The average list price per square foot of the available inventory in Brookstone is $0, which is the Athens average of $218. The Average Sales price of all sold real estate in this subdivision for the past year is $144,286. Recent comparable homes have been selling for 97.24% of their asking price. Waterfront homes represent of the available Brookstone inventory. The population of Athens, according to the 2010 Census, is 115,452. The total number of households in the zip code of Brookstone is 15,949, with an average household size for of 2.27 people. The total number of renter households within the zip code of 30605 is 10,099, which means that 36.68% of households in this zipcode are owner occupant households. 410 Brookstone Drive, Athens GA 30605 is a Home, with 3 bedrooms which is recently sold, it has 1,308 sqft, 0.0 - 0.25 sized lot, and Attached,Garage parking. A comparable Other, has bedrooms and 0 baths, it was built in and is located at and for sale by its owner at $ 0. This home is located in the city of , in zip code , this County Other, it is in the Subdivision, and Cedar Creek are nearby neighborhoods.